Seeing a football game in person is clearly better than watching it on TV, and not just because you get to avoid the 10,000 ads they air per game and John Madden's idiotic commentary. No, it also gives you a great opportunity to eat meat and get wasted in a parking lot. 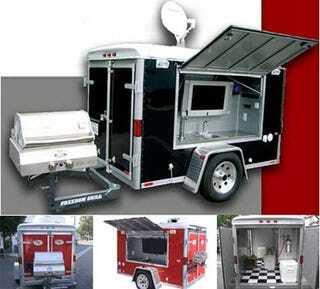 Helping you out in both those endeavors, this "Tailgating Trailer" is sure to make you a hero in your section of the parking lot.